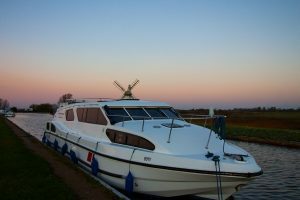 Now is one of our favourite times of year to be on the Broads as the National Park dons its winter coat and takes on a whole new persona. Waterways that were buzzing with boats only a couple of months ago are now transformed into a wonderful winter wilderness. So if you come on holiday at this time of year, you will almost have the whole place to yourself. 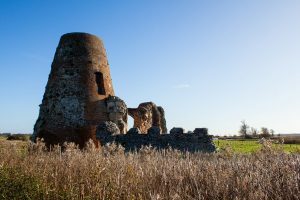 While there are far fewer human visitors, birds have been flocking to the Broads from northern countries to take advantage of the relatively warmer climate, while shyer resident species like otters and tufted ducks come out into the open to enjoy the tranquil conditions. 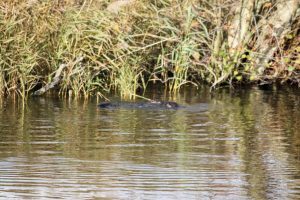 Spotting an otter is usually at the top of our guests’ bucket list and now is a great time to see them as they are more likely to come out into the open when the river is quiet. James Greasley managed to capture this magical moment, with two otters playing together, while enjoying a trip on our newest cruiser, the Fair Entrepreneur. Perhaps even more excitingly, we haven’t had to go far to see otters as they have been coming right into our boatyard! Boat basins attract large numbers of shoal fish at this time of year and the otters have been coming in for a nice easy meal. 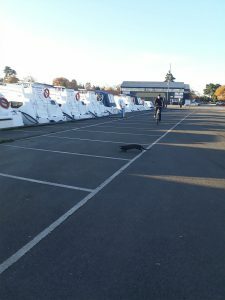 One of our team of Norfolk Broads Direct engineers, Simon, had more success taking this remarkable picture of an otter running across our car park and sitting on the quay heading for a minute! We are also seeing a good number of birds of prey out and about on the river, including buzzards circling high on the thermals or appearing from the woodland around Wroxham Broad. A kestrel is often seen perching at the top of a tree on Wroxham Island, only temporarily disturbed by our boat passing. “As we approach the kestrel it has tended to take off and fly over the island looking for a tasty morsel – on several occasions we have been able to watch it hovering and holding position whilst it inspects minor movements amid the vegetation,” explained Tobi. The area is usually a good spot to see the graceful marsh harrier. 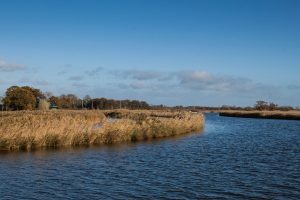 However, if you are on holiday with us it’s well worth making the short drive to Norfolk Wildlife Trust Hickling reserve where we are regularly seeing around 15 marsh harriers (as well as the occasional and even rarer hen harrier) circling together at sunset for their winter roost around the Stubbs Mill viewing area. On the same spot we have also seen around 20 Cranes flying in at sunset. Standing nearly 4ft tall they are one of Europe’s tallest birds with a wingspan of 1.8-2.2m and were extinct for more than a century before a small breeding population re-established on the Broads in the late 1970s! Back on the river Bure, another very much smaller species are guests have been delighted to see with increasing frequency is the little grebe, sometimes known as a ‘dabchick’. “Having had a few early spots of little grebes in the late summer, we are now seeing these dumpy little birds every time we go out on the water, “explained Tobi. Although little grebes are scarce in the main season, when the river becomes quieter the shy little birds venture out and congregate in growing numbers. 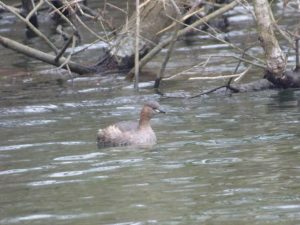 “What started off as a pair of little grebes just downstream of Wroxham Broad on a nice sheltered S-bend in the river has grown to a group of five, spotted twice on our trip on Wednesday – each taking its turn to delicately dive down to fish,” explained Tobi. Strangely the winter season seems to be having the converse effect on the little grebe’s cousin, the great crested grebe. “While great crested grebes are one of the most common birds spotted in the summer, sightings are less frequent at this time of year. We have only seen two or three pairs of great crested grebes on the duration of our trips although, of course, they are more difficult to spot at this time of year as their feathers have faded from the colourful orange breeding plumage to a white, grey and brown winter outfit,” Tobi explained. 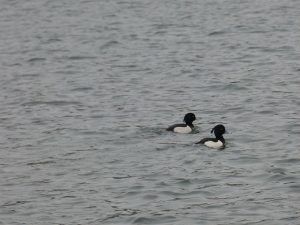 Tufted ducks have risen in number with 20-30 regularly hanging out at the shallow and sheltered northern end of Wroxham Broad. Tufted ducks are another bird whose numbers are bolstered with winter migrants. Whilst some are resident in the UK, we tend not to see any during the summer, as they are very shy and keep hidden away until boat traffic reduces in the winter season. The coots and tufted ducks seem to be quite sociable and a large group of both types of bird can usually be seen (50-60 total) on Wroxham Broad where they will be using up less energy in the shelter of the trees and shallow parts of the Broad. Here they dive down to pick up fresh water molluscs such as Zebra mussels. A few of the rarer Gadwall ducks have been flying past, probably heading over to Hoveton Great Broad. These wonderful birds seem a little like a female mallard from a distance but on closer inspection are smaller with an intricate barring pattern on their feathers. Cormorant numbers are also increasing, with seven or eight on the trees on Wroxham Island and a few on Salhouse Broad. Occasionally we’ve seen them swimming in the river or on trees in the villages. 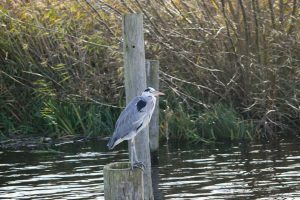 Another welcome sight is lots of grey herons, which continue to follow Anglers hoping for a free meal! 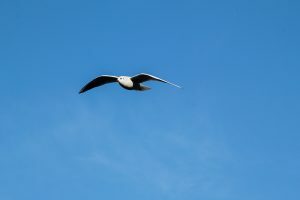 There are also lots of black headed gulls and Canada geese, which were almost absent in the summer but are returning to Wroxham in growing numbers. James managed to take these pictures of both species on a lovely sunny day while out on the Fair Entrepreneur. But perhaps the most enigmatic picture taken from the Entrepreneur that day was this flock of starlings. Starlings put on one of the greatest shows in nature at this time of the year – known as a murmuration. At sunset thousands of birds flock together making incredible twisting patterns in the sky that is designed to protect them from attack from predators, who find it difficult to pick off individual birds. They then settle down in the reedbeds to roost in these tightly packed groups to share warmth in the colder months and possibly to communicate information about the best feeding sights. 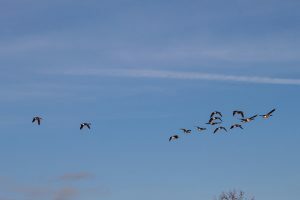 While you can see murmurations on many areas of the Broads it’s well worth taking a short drive (or much longer river trip) to RSPB Strumpshaw on the river Yare. 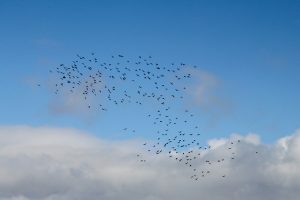 There are currently 20,000 of the little birds congregating near the reception hide and the sight of so many of them swirling in intricate patterns like smoke, with the sound of thousands of little wings beating is fantastic. 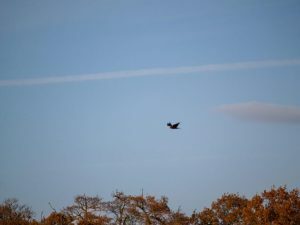 It’s made even more dramatic as birds of prey such as sparrow hawk, marsh harrier and buzzard try to swoop down on them. Usually the sheer numbers of birds confuses the predators or the starlings manage to dive into the reeds. But occasionally the predators get a meal. 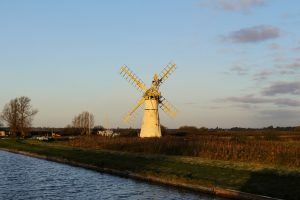 Finally, with the Broads reaching its autumnal best, we will leave you with some beautiful landscape pictures taken by James so that you can dream of your next holiday with us!